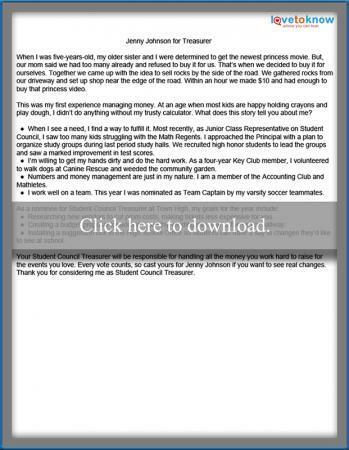 A student council speech for treasurer is easy to put together once you know what elements make up a good speech. You can also customize a sample treasurer speech. Unlike giving oral reports or presentations, a student council speech for treasurer is more of a persuasive speech. You not only get your point across, but it also receive the votes that will get you elected. Remember, you want to get as many votes as possible, so make sure you let your classmates know why you are the most eligible person. Consider starting your speech with a humorous story or something your audience will relate to. You can also ask questions and show everyone you know your topic. The important thing is to get classmates believing in you. Talk about your background with managing money. This could include funny stories, such as selling lemonade as a kid or how you've saved allowance money. Discuss the importance of creating a budget for student council. Talk about something you've wanted to buy and how you made this happen. Be sincere as you speak and don't try to change anyone's mind. Let your audience decide for themselves that you are the top choice. Make sure your speech has a beginning, middle, and end that flows together. It can work nicely to start and end your speech with the same points and then have everything in the middle help to prove your overall objective. Create a list of everything important you want to say. Try picking topic headings for each part of your speech and then write a few paragraphs or sentences below each one. Try writing the beginning of your speech last. That way you'll know exactly how to start it with a bang. During your speech, explain the facts. Do some research about your school and what might be possible for you to achieve as treasurer. Then, try to evoke a sense of emotion in your listeners. Get students excited about the types of things that a good treasurer can do. Rather than talking about it just from your perspective, keep the focus on how other students will benefit from you winning this role. Do research and present facts. Consider interviewing teachers or staff, take a poll to get student opinions, and even research teen spending habits. Point out how the winning treasurer will affect students and the entire school. Present this in terms of possibilities of what could happen. Arouse emotion in students, such as happiness, fear or excitement. Notice as you write your speech when you start to get excited and focus on those points. If you're still having trouble writing a personalized speech, this free, editable, printable speech for treasurer provides a starting point. Click on the image to open the document then select the download icon. If you have trouble downloading or printing, check out this guide. You'll always want to take a sample and make it yours, adding pertinent details. Insert your name where you see "Jenny Johnson." Start with an anecdote from your own childhood. Choose one that reflects your ability or passion in money management. Add in personal information about achievements and memberships. Stick to those related to the Treasurer position or leadership roles. Change the goals section to include your ideas on how to improve things at your school. Be sure to write your speech ahead of time and practice it. Once you get it down on paper, the process becomes much less overwhelming. You may even find yourself getting excited to stand up and deliver it to classmates. For more public speaking practice you can also try joining the debate team or giving a declamation piece for high school. In the end, whether you win or lose as treasurer, learning how to write and present speeches is a skill you can use your entire life.